Momz'Space: Meet Praggyah - An Army wife, an astrologer and Tarot Reader!!! 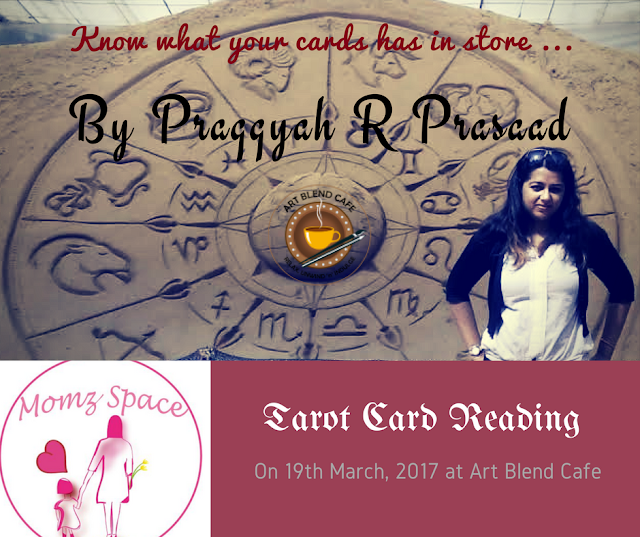 Meet Praggyah - An Army wife, an astrologer and Tarot Reader!!! Yes, you heard it right, this beautiful lady is a dotting Army Wife, a Banker and a fortune teller by passion. She defines herself as, "The quintessential High Priestess of the Tarot Card Deck I have played the role of the torch bearer and solace giver to many distressed souls, guiding them through their rough patches in the journey of their lives and filling in their heart the seed of all courage, Hope. I have been associated with eminent corporates and conducted Tarot events for them like Café coffee day, The pint room, Standard Chartered and so on." For me Praggyah has played an integral role for Momzspace community at large , and events we do round the year... She is very sportive, and supportive enough to host our previous events, tarot reading sessions, and also participate in all fun activities. She may not be able to suggest what shade of lipstick will suit you best, she can definitely help you to know answers you were looking for, and thus help you relieve your worries with her guidance and counselling. She has been associated with various corporate and centers, helping people heal from their problems. Being an MBA in Finance and Marketing, Praggyah surely knows how to play with numbers, cards and people. If you are looking for answers, be there for an enlightening tarot card session for yourself on Women's Day celebration on 19th March.